A few decades ago, Willow Creek Community Church was in trouble with the critics for shifting the believers worship time from Sunday to Wednesday. Now they are generating an even greater amount of conversation with their decision to close for Christmas day. – BlogCritics.org is not impressed. – Neither are Ben Witherington or Tim Challies. – Time Magazine noted the decision among a number of megachurches, including Willow and Fellowship Church. As for me and my house, I think Willow should have the right to determine the appropriate programing for their goals. Church is more than an hour on a Sunday and if people want to stay home and enjoy Christmas with their families and relatives and close friends RATHER than a gizzillion church attenders then leave them alone to get on with it. While we are talking about megachurch . ..
– The first church in the world, as far as we know, to stream live HD video from scratch is Fellowship Church in Grapevine, Texas. I have driven by this megachurch a hundred times but never gone in. Leave it Behind tells you how they manage the video streams. Oh puh-leeze. Having read the comments of the anti church-closure crowd, there seem to be several untrue assumptions going around. Among them, 1) that the building is the church. Thus, if the building is closed, the church is closed. 2) worship only happens in this building, sitting in rows. Therefore, 3) no bulding, no rows, no worship. Seems to me to be a very narrow view indeed of the nature of church and of the worship of God. Can God be freely worshipped, in a way that pleases Him, on Christmas Day, without a building or row-sitting or preaching being invovled? I believe He can. I beleive Romans 12.1-2 speaks to this. I just want us to be more honest with why or why not and own the fact that churches have gotten too dang big and too dang complicated. Once upon a time, having church on Christmas meant someone unlocking the door, turning on the heat and picking a couple of carols for the accompianist to play as the people sang. We could have a morning together as a family, worship together as a community, and go home for a beautiful Christmas dinner. Nowadays, it’s a little more involved. Why aren’t many having a church gathering on Christmas? Because the hours and the work and the volunteers it takes to carry off the average mega church service, not once but twice or even three or four times for many congregations is untenable in the face of times like Christmas. Our productions have gotten so involved, so detailed and labor intensive (not to mention the fact that the average church Christmas play/production just about kills everyone involved) that most churches would rather take the “hit” of cancelling for a Sunday rather than trying to round up the volunteers to make it all happen. There are a lot of good defenses and apologetics for the mega church- it’s not all bad, but the real reason many can’t have church on Christmas is because the production just got too big, and the volunteers would rebel at having to “work” Christmas. To me, another good reason to grow continually but stay relatively small and simple through church planting! just as i am standing with Bill on his decision to close shop on sunday – a decision FOR the church people and volunteers rather than FOR the program. but you know the church – on the freeway – just south of the Grapevine Mills shopping mall with the RAinforest Cafe? Right? Sure sure… I think giving the volunteers the time with family is an excellent, excellent decision. …I guess that would be too obvious. Hi I’m Will, long-time reader, first-time poster. First of all, while Christmas is important, it isn’t the most important holiday of the year. We make it so, but frankly, it isn’t. And while mega-churches frighten me (like, really bug me out), I am also going to support Willow Creek’s (et al.) decision to drop Christmas Services. The Communities (emphasis on the plural) that thrive within (and some would say, despite) the mega-churches of the World will ways to worship with each other. The people who want to get together will get together. That’s that. Let’s give the workers a break, because Easter is going to be nuts. At my teeny-weeny church, we’re having ‘pajama day’. Just show up and we’re going to hang out, maybe eat some festive oodles. Family-time. Just a question: Which is the more emerging church position? It seems that caving to the culture and remaking Christmas into family time is pretty individualistic and modernistic. It seems that if our traditions have any merit or value to create sacred space and lead us into legitimate worship experiences it would be around our Christian holidays. Compare this with the big debate about being able to say “Merry Christmas”. We throw a fit when the clerk at Home Depot says Happy Holidays as I buy my Holiday Tree, but then we can’t put the presents down long enough to worship Christ with our faith community on Christmas. It seems that we are more concerned with the culture propping up our faith than we are with really encountering Christ. I realize that we can worship Christ anywhere, anytime, but I do not think that this is about the definition of church. That debate rages on for another day. Shouldn’t we want to have a meaningful spiritual experience on Christmas Day of all times? I think that we have made too much of Christmas being about “family time.” Brian McLaren wrote a book called Adventures in Missing the Point. This episode would make a great chapter. 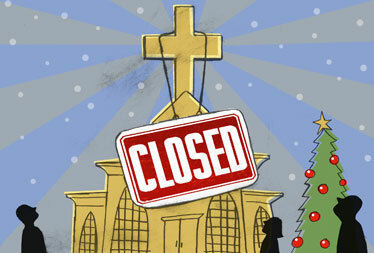 I think that closing church on the second most holy day of the year is horrible. Christians have sat back for years as these new megachurches give us “church-light.” I haven’t noticed anything coming from these suburban churches except that they are the suburban culture with a few God words thrown in. Of course church is more than a building. It comes down to what is most important. I am Protestant and the most important thing we can do is worship God, and we are called ton worship together. Worship is meant to be shared together, and worship can look different ways. I believe that worship can include guitars or no music at all as long as it is giving our best to God. What passes for worship today has to pain God because it is not praising, but offering up an ‘80s love ballad with the word, God in there. Also, to hear the statement, “I worship by myself, or I worship with my family in our living room.” Give me a break! We are called to worship together just as we share communion together. Honestly, most of those churches that are canceling services are boring and remind me of boring Baby Boomer culture. Give me high church any day to teach me, to grow me, and to challenge me to be more than a whore for suburban mediocrity! “second most holy day of the year”? what makes any day more holy than another? The bible certainly doesn’t mention Christmas, and I’ve read that the day jesus was born may not even be close to December 25. That being said, there are good explainations for and against the position of having church, but using the “this is the second most holy day” argument, in my opinion doesn’t really fly. Whether, one (Justin) likes it or not, Christmas is the second most important day for Christians to celebrate and remember. Obviously Jesus was not born on December 25th, but that it is the day that we use to remember. To say that Christmas is not a valid argument for Christians needing to meet reminds me of the Reformers who burned the organs because organs weren’t mentioned in the Bible. Christmas is the time where Christians gather together to celebrate the birth of the one who came to save the elect. the refomers in scotland clamped down on christmas and it wasnt until the 1960’s that Christmas day was an official celebration with a day off for the workers. I see that the blogmeister has taken over some of the discussion with the “Reformation Talk.” My point with all of this is that Christians are called to worship together. One could make the argument that Easter services are not needed. As a Protestant I believe everyday is Easter because Jesus is risen. For churches to close on Sunday the 25th because they can’t get people to work is atrocious. I am a pastor and to gather my flock on Sunday the 25th is anything but work. It is an absolute joy! The Christ child is born, Alleluia!! Christmas Eve and Christmas Day regardless of whether or not it falls on a Sunday. While this can be a burden to the regular staff and volunteers perhaps, within each church exists a group of individuals who would love the opportunity to be a part of a Christmas Team for their churches Christmas Celebration. Last night, I sadly witnessed the church administrator move through the motions of leading worship without ever smiling or proclaiming the joy of our Savior. It was obvious that he was only fulfilling work obligations. Thinking quietly I said to myself, we need to keep him in the office and get some people in front of the congregation that are on fire for Jesus Christ. Surely within the body, there are several who would embrace the opportunity to share their passion on Christmas Day regardless of what day it happens to fall. hey my church or about 500 people closes down from the 10th(ish) of december till the 20th(ish) of january. i’m in new zealand, so that’s kinda the height of our summer holiday period. as far as i know (i’ve been going for about 5 years) no-one’s complained about it at all.. we just relax. people need to chill out. we have a huge dinner on the last night (by the way, we have church services on wednesday nights and sundays @5pm) they print us up a booklet of the whole church’s phone numbers and then people can hook up that way. we celebrate jesus everyday so for us, it’s not a big deal. http://www.mtv.org.nz if you wanna check it out.